CLICK THE LINK BELOW to submit your email to us to request your date. We'll send you an initial confirmation, and then follow up with more info and a link to secure your appointment at an open time of your choosing. The full mini session fees are requested upon booking in order to hold your time slot, and easily paid via PayPal (credit/debit). These fees are nonrefundable, but we will do our best to reschedule at a convenient time. Your date and time is not reserved until we have received your signed contract and session fee in full. 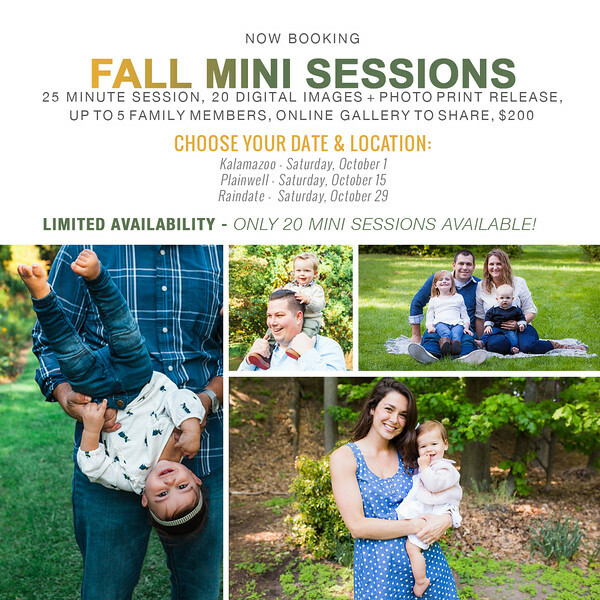 Our annual mini sessions are popular, and openings are very limited - so be the first to sign up! Sessions are just 30 minutes, and scheduled every half hour. Up to five immediate family members may be included with each mini session, and just one outfit for each person. If you have more than five immediate family members, we can book back to back mini sessions or offer add-on rates of $20/person to accommodate your family. This is very ideal for parents with young children who may not have long attention spans - we can get you looking great really quick, and you'll have FORTY beautiful images to call your own, after they have been processed, edited, and delivered to you. Our mini session includes one 8x10 print (your choice of image), and an online gallery to view, share, and order additional prints from. We will have samples of custom products and prints with us at your mini photo session, for you to check out and get an idea of the high quality and craftsmanship of these items. CLICK HERE TO SECURE YOUR MINI SESSION!